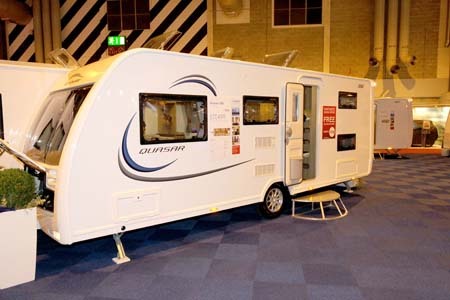 ﻿ 2015 Lunar Quasar 586 caravan review: A splendid six berth! 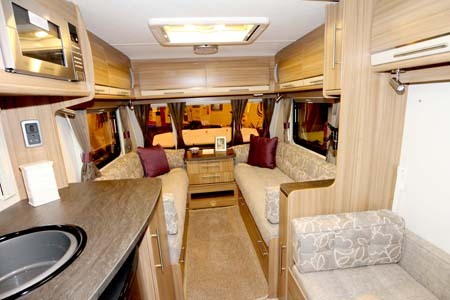 2015 Lunar Quasar 586 caravan review: A splendid six berth! 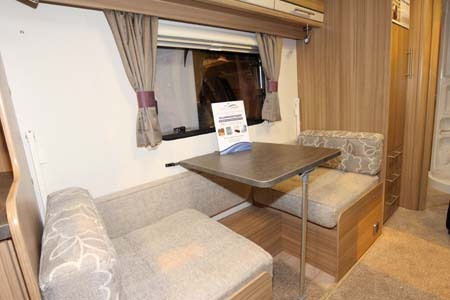 The Lunar Quasar 586 is a new six berth layout first unveiled at the NEC show in October. It features fixed double bunk beds at the rear, a spacious front lounge, a side dinette on the offside which converts into two bunks and side washroom in the rear offside corner. 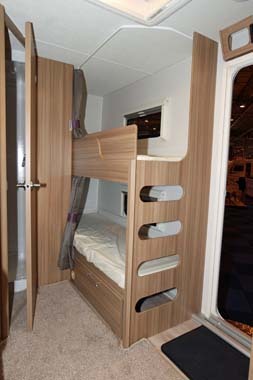 Wardrobe space is a tad shy for six people but it does have three drawers opposite the fixed bunks which each has its own LED light, small window and there is an integral ladder to the top bunk. Access to the head end of the bunk is understandably inhibited due to the design of the shower room, but there is good use of the space available overall. 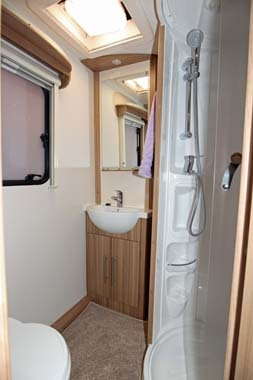 The shower room has a round one-piece shower cubicle with an acrylic door, a neat vanity basin with a mirror above and a cupboard under it and Thetford 260 cassette toilet. A curved pelmet shelf above the window is a nice design touch and softens the square appearance. The kitchen is on the nearside and has a round black sink complemented by a black fronted fridge and four burner hob with three gas and one electric plate. This is supplemented by an oven, grill and 800w microwave oven. The lounge end is traditional parallel seating with a centre chest of drawers. There are several lockers at eye level and good access to the under sofa storage space. The Montana Oak wood grain cabinets, high impact laminate worktops and the wood effect floor covering blend well with the “Kassis” soft furnishing scheme; there is an optional Aquaclean “Caribou” soft furnishing available at a cost of £299 and with children on board, it might be a wise choice and the carpet is flagged up as being stain resistant. The kitchen lockers are cream, reflecting the contemporary banding on the other lockers. Lighting throughout is LED and there is a water saving Ecocamel shower head. Heating and hot water is courtesy of a Truma 4KW combi-gas and electric boiler. The exterior has re-designed wheel spats, a colour coded awning rail and distinctive graphics. Six berth caravans are a small proportion of the market, due to demand, but this layout may well suit a family with two youngsters. If you add optional extra security features, such AL-KO Secure wheel lock (£239.00) and AL-KO Secure ATC Trailer Control (£349) or even a Phantom Tracker Alarm (£449) the cost to insure the Lunar Quasar 586 will significantly reduce, making it a smart choice for those wanting to save money. 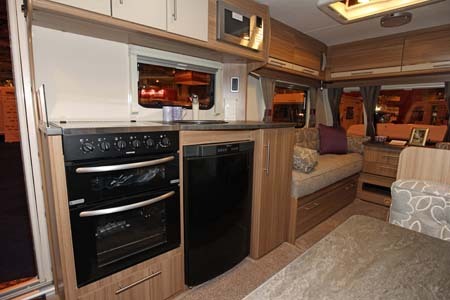 *Caravan insurance cost based on 2015 Lunar Quasar 586 retailing at £17,499 fitted with hitchlock, and optional alarm, AL-KO Secure wheel lock and AL-KO ATC. Kept on drive at HX4 0BE. Caravanners over 30 years old, claim free for 3 years and a member of a caravanning club. £100 excess. 180 days European cover and up to £75 per day for up to 15 days emergency accommodation cover included. Legal expenses cover, extended European cover and other emergency accommodation expenses cover options are available at extra cost. Quote includes 10% online discount and 6% Insurance Premium Tax and is correct as of [date}.